Evans was drafted by the Mets as a SS in the 15th round in 2011 & has had his fair share of ups & downs throughout the last couple seasons, where he’s been playing in high A as well as just under 100 games for AA Binghamton. What’s interesting about Evans is that he was drafted in the 15th round out of La Costa Canyon HS in Carlsbad, California but the Mets paid him 2nd round money, in order to keep Evans from going to San Diego State. Thursday vs the Marlins, Evans took a 0-1 pitch with the bases loaded & then proceeded to unload them as he put the baseball well over the left field wall. He would eventually have 5 RBI’s that day, going 2-2 as he had an RBI single a little later in the game. Evans looks to have put on some weight & muscle, looking pretty good this spring. He’s a lifetime.255/.318/.344 hitter throughout his 5+ plus seasons since being drafted. However, last season he hit an amazing .321/.366/.460 with a .826 OPS, putting his name in the discussion when it comes to potential mid-season call ups, in case of injury. Scouts see Evan’s ceiling as “Utility Infielder” & I believe that’s an accurate call. He plays the left side as well as 2nd base pretty solidly. It’ll be interesting to see if management puts him at 1st & maybe even in left field this upcoming season in the minors to see just how versatile he can be but what’s most important is that he continues to improve his ability to square up on the baseball. Evans had a break out season in the Eastern League in 2016. It was his first good season in the minors. It was the first season where Evans was able to hit over .300. He ended his 2016 campaign with a .321 batting average between the St. Lucie Mets and Binghamton Mets. 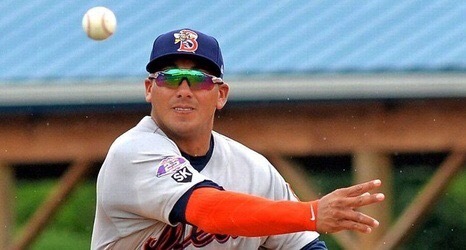 He won the Eastern League batting title hitting .335 in 96 games. Evans mostly plays third but, he can also play short and second. One issue I have with Evans is his low walk rate. His OBP was just .366 this season and thats fairly low considering his batting average. His career obp is just .319 which is very low. This spring Evans looks in great shape. He looks like he has added muscle. He makes solid contact and plays good defense at third. But he did that mostly against the lower level of pitching in spring training which you have to put in perspective. I want to see him duplicate his 2016 campaign because, I worry about his lack of walks to be a succesfull MLB player.